Last June, I blogged about a local link to the Titanic disaster, namely a sign on a fence at a house around the corner in the King's Park area of Stirling, marking the former home of the ship's Sixth Senior Engineer, William Young Moyes. The date of that blog post, in June 2011, was the 100th anniversary of the launch of RMS Titanic from the Harland and Wolff shipyard in Belfast. After several months of fitting out the ship, the Titanic's maiden voyage ended in disaster and tragedy following a collision with an iceberg in the North Atlantic on 14th April 1912, the sinking of the supposedly unsinkable vessel by the early hours of Monday 15th of April resulting in 1517 deaths among the passengers and crew, including Stirling's William Young Moyes. I find it sobering to think that, had the Titanic run head first into the iceberg, rather than steering around it and receiving a fatal blow to the side, she might actually have survived, with fewer of her watertight compartments ruptured, even although she was travelling at her top speed (was it 22 knots?) at the time. According to the Wikipedia article about the sinking, liner collisions with icebergs weren't uncommon. Indeed, in 1907: "SS Kronprinz Wilhelm, a German liner, had rammed an iceberg and suffered a crushed bow, but was still able to complete her voyage." And that ship wasn't being claimed as unsinkable. 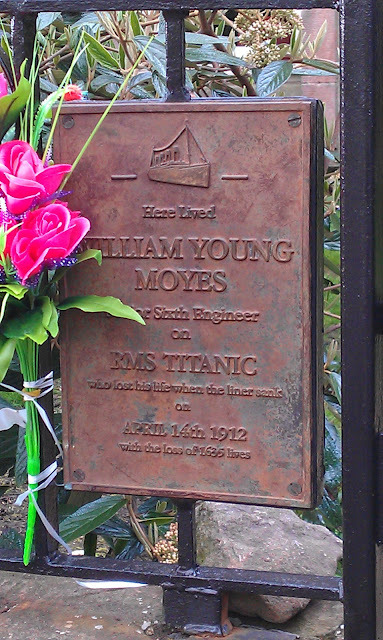 I've posted another photo of the Moyes memorial sign above, taken this week, with floral tribute. We'll raise a wee glass tonight to the memory of Mr Moyes and all the other poor benighted souls who perished 100 years ago today.